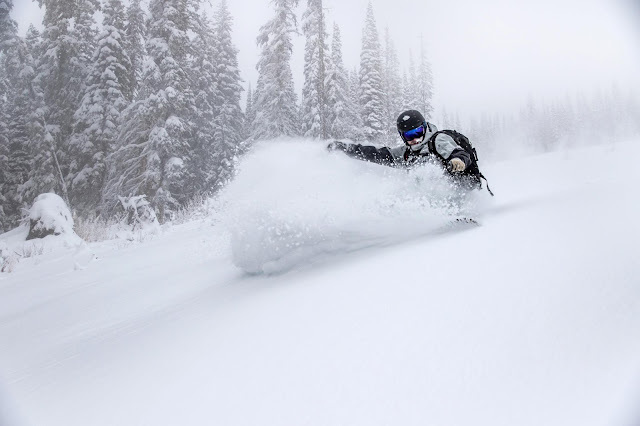 If you are in Revelstoke, you are dedicated to wintersports, powder pulses through your pores, and “first tracks!” is your early morning mantra. 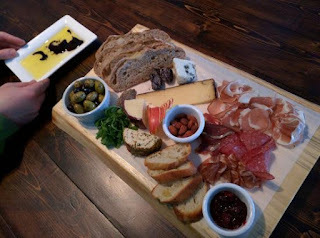 The tempting town takes a bit of effort to reach - 4.5 hour drive from Calgary, 5.75 hour drive from Vancouver, 4.3 hour drive from Cranbrook, 2.5 hour drive from Kelowna – and there are occasions when the irascible Rogers Pass is blocked to traffic due to weather or avalanche danger. However, these niggling negatives are positive pluses for powder-seekers, hence the thriving and multi-faceted ski bum/seasonal worker/international and domestic tourist/weekender culture in a town teeming with hill, heli and cat skiers. For our Revy road trip, the roads were clear, the pass was open, and we arrived just ahead of an overnight dump. Taking advantage of the mid December lull, we saw hardly another car on the highway which was bathed in sunlight and swirling cloud. The towering mountains, dense forest, and occasional elk herds evoked the immensity of nature with 95 percent of the scenery unmarred by man’s manipulations. Our mission was to drive our younger son, Fergus, to Revy to meet his CMH co-workers for a ride to the Adamants Lodge heli-pad, launching him on a hedonistic heli-season working on the Hospitality Team. That also had the sense of the epic about it – making me think back to the 2 ½ year old who insisted on skiing rather than playcare, who gave up the bunny runs at 3 and learned to do short swing turns on the bumps rather than ski the way-too-busy home run at Verbier, and who spent three weeks in the Swiss ski school at age 3 ½. The youngest kid in the Nancy Greene League Avalanche Club at Mt Norquay, he was accepted at the age of four into the racing program even though the minimum was five. So, I suppose it was inevitable he would go straight to the top and get a seasonal job with a heli-skiing outfit for the first winter of his post-university gap year. Before he left, we spent one precious day skiing with him at Revelstoke Mountain Resort, one of his fave ski hills after many multi-family outings there with the Alberta Freeskiers (now Evolve Ski & Snowboard Club), a Lake Louise-based group he joined in his teens. We were joined for the afternoon by one of his CMH colleagues, a Swede who alternates her two-week work schedule at the heli-lodge with a week’s skiing at Revy – jealous! Skiing that first run of the season at Revy was the quickest way to shrug off the weight of the world and become instantly at one with winter. No warm-up run, straight onto the radical Revy gradient. Love that magical moment when mental gives way to pure physical and glee takes place of daily drudgery. Legs singing, scenery filling our senses, our pow performance was judged by towering trees in powdered wigs punctuating the pistes. Latte time at the lodge! 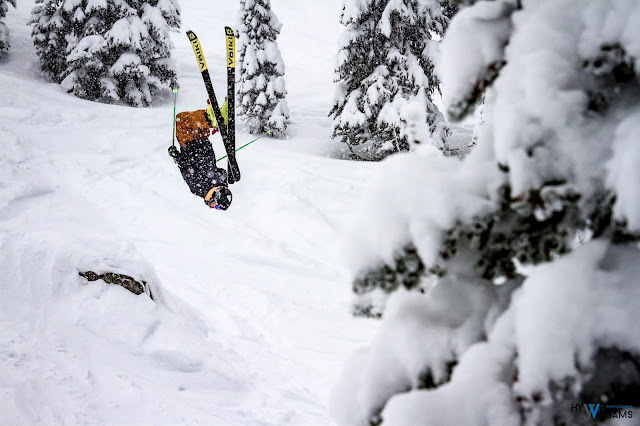 When the ski hill first opened with the Revelation Gondola 10 years ago, many seasonal workers worldwide upped and relocated to Revelstoke in search of the next frontier – many are still there and have been joined by more mountain migrants. Recreational retirees – such as Americans Carol York and Peter Fotheringham - bought into the Sutton Place Hotel development before it was even built – they are still there, too, reveling in the 9 -14 metres of snow annually and regulars at the Sutton Place Hotel nightly mix-and-mingle drinks party. The 2008 recession slowed down development for a while but Revelstoke is back on the gently gentrifying trajectory now, with eclectic eateries, craft breweries, distilleries, and boutique businesses burgeoning on the hill and around town. One such is The Cube Boutique Hotel where we stayed, attracted initially by its Mondrian cuboid exterior, black and white with splashes of orange, lime and grey. It was designed by Louis-Marc Simard, a hotelier, artist and ski tourer latterly from Field, BC. Dubbed ‘not your average hostel’ by the New York Times, it does have shared showers but the hostel homage stops there. For example, have you ever been to a hostel with crisp white bath robes laid out on each bed? Or drank your morning cappuccino from a state-of-the-art $3000 espresso machine? Or been cordially asked to remove your soap scum from the shower walls with a stainless-steel scraper suspended in each cubicle? “It’s a hostel for adults,” says Simard, who prices his product carefully to deter party animals. There are some dorms, but The Cube contains mostly private rooms with two, three or four beds plus a washbasin and your own loo. All immaculately kept, the décor has been designed with Simard’s artistic concepts – and some of his own sculptures. “I haven’t picked up a paintbrush for five years since building The Cube,” he says. “This hotel is now my work of art.” When he does get a few hours off from hotel hospitality he heads into the backcountry for ski touring. One of our favourite watering holes is the Village Idiot Bar & Grill which this season is featuring a “vid-iot” contest where budding filmmakers submit ski videos to be publicly viewed on Monday nights and then judged at the end of the season for prizes including heli-skiing and ski swag. 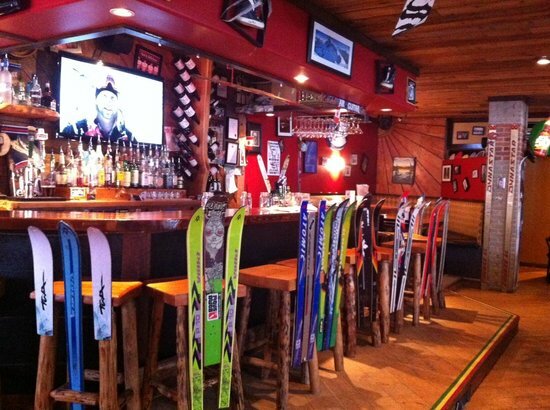 Recommended for mingling with locals, recycled ski barstools, Idiot Twists (a kind of cheese straw appie) and bustling bonhomie. Opposite the Idiot is the new Monashee Spirits Craft Distillery for local vodka and liqueurs and up the hill, overlooking town from the Hillcrest Hotel area is the new branch of Mt Begbie Brewery, launched in December - the company was awarded Canadian Craft Brewery of the year for 2017. New to us, too, this season was the Explorer’s Society Hotel which houses a very chic bar in the French-inspired Quartermaster Eatery (with nine hotel rooms above) featuring funky cocktails concocted by career bartenders. Also tried the Craft Bierhaus with its creative craft beer menu (over two dozen taps), designer salads, veggie and gluten-free options, long communal tables, young and upbeat atmosphere and raucous acoustics. In the past downhill decade, the City of Revelstoke has transformed from rather rundown to rural-ritzy, while retaining the casual quaintness of an historic mountain village: still beautiful, still authentic, and as yet unspoiled. 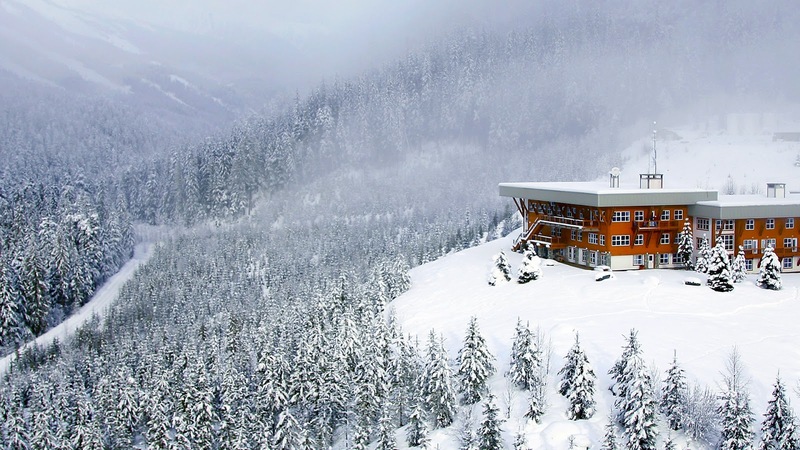 The five-minute route to the ski hill from town is now sprinkled with modern mountain homes and, with a major new development underway, it is slowly becoming a sumptuous second-home settlement. The skiing is sensational, the snow already at 632cm snowfall with 180cm base this season, and the tantalizing town joie de (outdoor) vivre is supplemented by the hedonism of heli-skiers and the Cheshire grins of cat-skiers. New for 2017/18: 24 percent increased lift capacity this season from 7,299 to 9,700 per hour - achieved by adding 24 new gondola cabins and 21 chairs. The grooming fleet has been expanded and modernized with two brand new PRINOTH Tier 4 Bison winch cats. These state-of-the-art groomers offer a significant increase in fuel efficiency, and meet stringent exhaust emission standards set by the Environmental Protection Agency (EPA). Heavy equipment operators have also spent the summer excavating and smoothing out many of the runs at lower elevations to improve grooming efficiency. 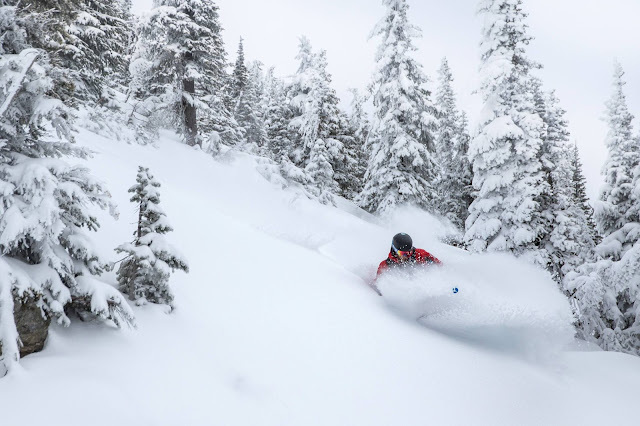 For those seeking an intimate powder experience, Revelstoke Mountain Resort has joined forces with Great Northern Snowcat Skiing offering a small group, single-day cat ski experience in the Bad Shot Range in the Selkirk Mountains, south of Revelstoke. With a seasonal average of 50 feet of snow and access to 75 square kilometres of terrain over two mountains, it's first tracks all day.